The science dealing with those institutions, customs, literature, and beliefs of the folk or uncultured people that can not be traced to government origination or individual authorship. In its larger sense it could claim as its province the whole of institutional archeology, but in actual practise it deals only with the "survivals" of primitive institutions. Its special field deals with those survivals known as superstitions (from "superstes" = "surviving"), that is, those customs carried out for no other reason than because persons respected by the doer also perform them. The modern method is to attempt an explanation of such seemingly irrational actions by tracing them back to ideas, which in themselves often absurd, are current among savages, and to which the customs are natural corollaries. Thus, for instance, the objection to horse-flesh as a diet in some parts of Europe has been traced back to the pre-Christian worship of Odin, to whom the horse was sacred or taboo. Folk-lore thus deals with the irrational element in life, though often including some of its most imaginative aspects. The chief influences that have prevented the further spread of folk-lore elements among the people have been the Greek sense of reason and the Jewish sense of right. It is consequently difficult to deal with the subject from a Jewish point of view, since in essence there is no Jewish folk-lore; yet practically, for reasons which will be indicated, there have been survivals of folk-lore among the Jewish people in all stages of its development. The human nature in Jews has often led them to those manifestations of human fear, hope, and joy with which folk-lore deals. The Jewish people in Bible times undoubtedly had beliefs and superstitions analogous to those found among their contemporaries, and even among modern uncivilized peoples. Professor Robertson-Smith in his "Religion of the Semites" (see analysis by C. G. Montefiore in "J. Q. R." ii. 179), attempted indeed to derive many of the fundamental institutions of early Israel from two folk-lore conceptions, taboo and totem. Similarly, Gunkel in his "Schöpfung und Chaos" attempts to prove that the Hebraic views about the beginning of things and of mankind are derived from those current in Babylonia, and his views have been repeated in exaggerated form by Professor Delitzsch in his "Bibel und Babel." In both cases, however, the evidence adduced is so hypothetical that the conclusions derived from it can not be regarded as proved. Parallels found between Biblical and uncivilized views can throw light on the former only when the connection of the latter with some wider view is established. Thus, when the Biblical principle that blood is life is found among the Yorubas of the west coast of Africa (A. B. Ellis, "Ewe Speaking Tribes," p. 68) the parallel is interesting, but has no further instruction in it. When, however, the custom that the younger sister must not marry before the elder, found in the case of Leah and Rachel, is found also among the Nias (Rosenberg, "Malayische Archipel." p. 155), among the Hahmaheras (Riedel, in "Zeitschrift für Ethnologie," xvii. 76), in Java (Winter, in "Tijdschrift Voor Nederl. Indie," i. 566), and China (Gray, "China," i. 190), it becomes probable that such a practise has natural roots in polygamous societies. Again, the fact that the Iroquois Indians had an annual ceremony for the expulsion of all evil which was combined with a general confession of sins (Frazer, "Golden Bough," iii. 72), throws no light upon the Day of Atonement except in so far as it serves to show that such an institution is natural to humanity. Maimonides went so far as to grant that many of the practises commanded in the Bible were really pagan in character, though permitted to the Jews as a sort of concession to their human weakness ("Moreh," iii. 32, transl. by Munk, p. 252). It is somewhat different with practises mentioned in the Old Testament for purposes of condemnation. The very condemnation is presumptive evidence that the practises complained of partook ofthe character which is ascribed to folk-lore. The custom of tattooing is probably repudiated in Lev. xix. 28, and the fact of this repudiation renders it highly probable that in several cases the tattoo was a sign of allegiance to some local deity. Similarly, the "soul-hunting" referred to and reprobated in Ezek. xiii. 17 et seq. was probably analogous to the practise observed among the Canadian Indians by the Jesuits ("Relations des Jésuites," 1637, p. 60, quoted by Frazer, l.c. i. 139). The Canadian wizards sent out familiar spirits to seek the souls of their enemies, which they brought back in the shape of stones, and the wizards then broke these with swords or axes, and by this means destroyed their enemies. Thus folk-lore by comparative research may throw light upon certain Biblical practises, but they are just those practises that are opposed by the Hebrew prophets. Similarly, the legendary stories of the Old Testament may at times be illustrated or paralleled by the folk-lore of savages and uncivilized peoples. The strong men of David live again in the paladins of Charlemagne. It has been suggested by so prominent an authority as De Goeje that the story of Esther is found once again in the framework story of the Arabian Nights. At times it would seem as if some of the legends of the Bible were explanations of folk-lore customs, the object of which had fallen into oblivion. Thus the story of the wrestling of Jacob with the angel is obviously intended to explain the practise of avoiding sciatic nerve as food; the original object was possibly based on some fantastic folk-lore analogy. See Folk-Tales. A custom like that of walking on the sidewalks when the plague was in the town, and in the middle of the street when the town was healthful, might have been founded upon some particular experience, but the reason given, that the Angel of Death walks about openly in time of plague, and sneaks near the houses at other times, is little more than a metaphorical repetition of the experience (B. Ḳ. 60b). On the whole, the list of folk-lore beliefs and customs given in such a book as Brecher's "Das Transcendentale, die Magie und Heilarten im Talmud," is comparatively meager. In the direction of popular custom the Talmud offers a field for wider investigation. It is possible that several of the customs mentioned there could be traced back to Bible times, as is indeed often claimed for them. The importance attributed to the burning of the "ḥallah" in the home of every Jewess is possibly traceable to some early form of hearth-worship, as parallels exist elsewhere (Coulange," La Cité Antique"). The extension of the principle of not seething a kid in its mother's milk to all kinds of meat is probably another instance of Palestinian custom, only slightly represented in the Bible. When the history of the Halakah has been more systematically and critically carried out, it may be possible to recover some of the folk-customs of Bible times from this source. Similarly it may be possible to distinguish in the haggadic legends of Biblical character those portions that probably formed part of the original accounts from those that have been developed by the exegetic principles of the haggadists. In the later Haggadah there are some elements probably derived from Indian and Greek fables (see Fable), while others resemble the quaint plays of fancy found in modern drolls in the so-called "Lügenmärchen" of German folk-lore. In one particular direction the Talmud is of extreme interest for folk-lore investigation, namely, the transition from maxim to proverb, which can be clearly observed. While there is a considerable number of anonymous Proverbs, there is a still larger number of wise sayings, which, owing to the Talmudic principle, "say a thing in the name of the man who says it," can be traced to their authors, and are therefore maxims; for example, the saying "Descend a step to choose a wife; ascend a step to choose a friend" would be considered a proverb if it did not happen that one is able to trace it to its original author, Rabbi Meïr. After the dispersion of the Jews it becomes increasingly difficult to speak of specifically Jewish folk-lore. Spread among all the peoples of the earth, the Jews appear to have borrowed customs from each of them, and when found among them to-day it is most difficult to determine: first, whether the custom is at all Jewish; and, secondly, if non-Jewish, whether it belongs to the country where the particular folk-lore item is found, or has been brought thither from some other country. 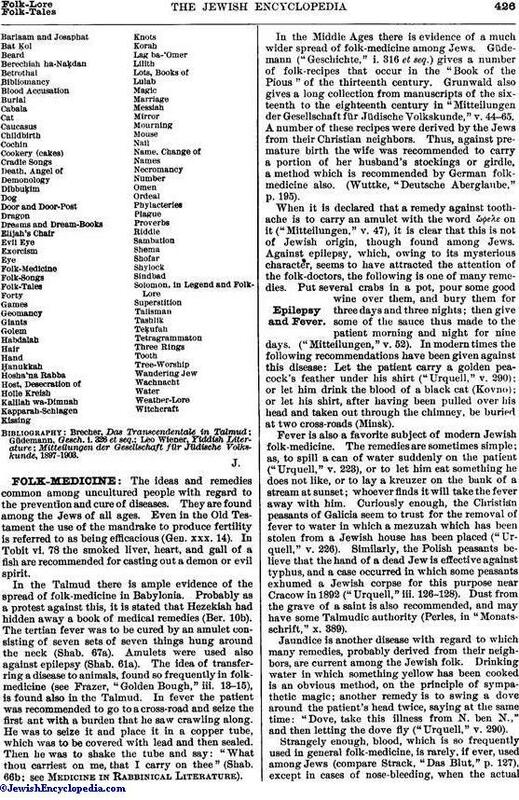 Thus among the Jews of Lithuania and Austria is found the German remedy against toothache, to look at the hole of a mouse and pronounce theGerman formula commencing "Mausele, Mausele!" As the Lithuanian Jews still use this formula, the custom has clearly been brought by them from Germany. Or, again, as early as the twelfth century, the Teutonic test of murder was to bring the suspected murderer into the presence of his victim, when, if guilty, the wounds of the murdered man bled anew. This is found in the Sefer Ḥasidim, No. 1149, and, five hundred years later in Manasseh ben Israel's "Nishmat Ḥayyim," iii. 3. A variation in custom is sometimes found between one set of Jews and another which enables the inquirer to determine the origin of them. Thus, English Jews sometimes show a disinclination to sit down with thirteen at a table, probably copied from their Christian neighbors who connect the superstition with the Last Supper of Jesus; whereas Russian Jews consider thirteen as a particularly lucky number, as it is the gemaṭria of , the last and most important word of the Shema'. It is never safe to assume that a modern Jewish custom is necessarily Jewish. Such a widespread one as that of the "shaitel," or habit of shaving the hair of women after they are married and replacing it by a wig, is found among the ancients (see Pausanias, ed. Frazer, iii. 279-281) and among the Fiji-Islanders and the Kafirs (Crawley, "Mystic Rose," p. 366), and might seem to be a survival from Bible times, yet it is not followed at all in Palestine (M. Reischer, "Shaare Yerushalayim"). When, therefore, the custom of covering mirrors after death, usual among the Jews, is found also in Oldenburg (Wuttke, "Der Deutsche Aberglaube," § 728), it may be safely assumed that the Jewish custom was derived from the German, and not vice versa. Again, the custom of "sin-buying" observed among the Jews of Brody ("Urquell," iii. 19) has its analogue in the "sin-eater" of Wales ("Folk-Lore," iv.). In the Jewish practise a ne'er-do-well would take upon himself the sins of a rich man for a definite sum. Cases have been known where a person who has taken another's sins upon himself has felt compunction upon the death of the original sinner, and has visited his tomb and in the presence of witnesses deposited upon the tomb the sum originally paid for the sin, begging the dead man to take back his sins. Though found among Jews, there is little probability of this practise being originally Jewish. On the other hand, there are customs among Jews which can be explained only from specifically Jewish notions, and are rightly included in Jewish folk-lore. Thus, in Minsk there is a belief that if for thirty days you are not "called up" to the Law you are ritually dead, and a Cohen must not approach you, just as he must not approach a corpse. To ascertain whether you are really dead or not, when you are called up after the thirty days, look at the letters of the scroll of the Law, and if you can discern one letter from another there is some mistake and you are not dead, for the dead when called up at night in the synagogue can not read. Here the whole conception is a development of Jewish ideas, and so far it may be regarded as a genuine item of Jewish folk-lore. Or, again, the curious belief that the resurrection of the dead will take place in the valley of Jehoshaphat, and that, therefore, the corpse must have a three-pronged fork to tunnel his way to Jerusalem if buried out of the Holy Land, is a specifically Jewish corollary to the veneration of Jerusalem. Or, again, the belief that any piece of iron will turn rusty if exposed on the four "tekufot," or seasonal changes of the year, appears to be specifically Jewish, yet later than Talmudic times. When Jewish customs find their analogues in savage practises, the problem of determining the source of the custom becomes more complicated. Thus, the Banks-Islanders, like the modern Jews, bury their nail-parings ("Jour. Anthrop. Ins." x. 283). It is obvious that the Jews could not have borrowed the custom from the Banks-Islanders, yet they may have borrowed it from races that had passed through stages as savage as the Banks-Islanders. The practise is found referred to in the Talmud (M. Ḳ. 18a), and even there may be a borrowing from the Babylonians. 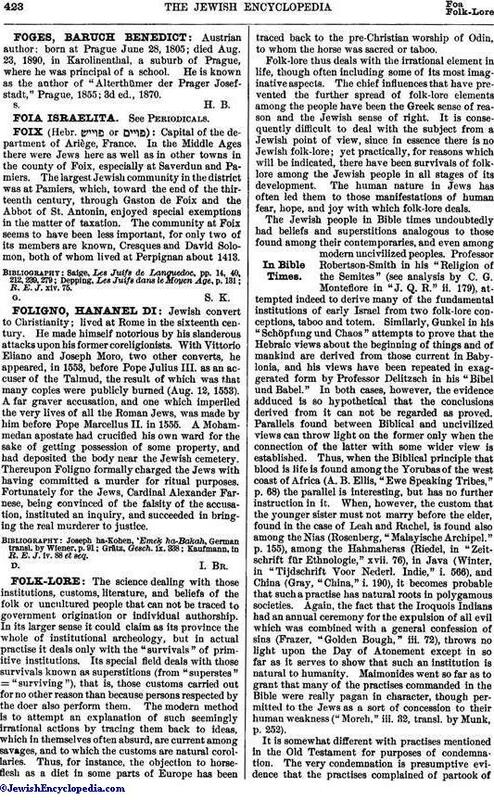 For this reason it might seem likely that the Jews would be favorable media for transplanting folk-tales and customs from one nation to another, owing to their continuous migrations; their social isolation, however, has prevented much of this kind of intermediation, and no decisive evidence has been adduced in regard to it. On the other hand, in the literary transmission of Indian folk-tales from East to West, Jews have played an important part. 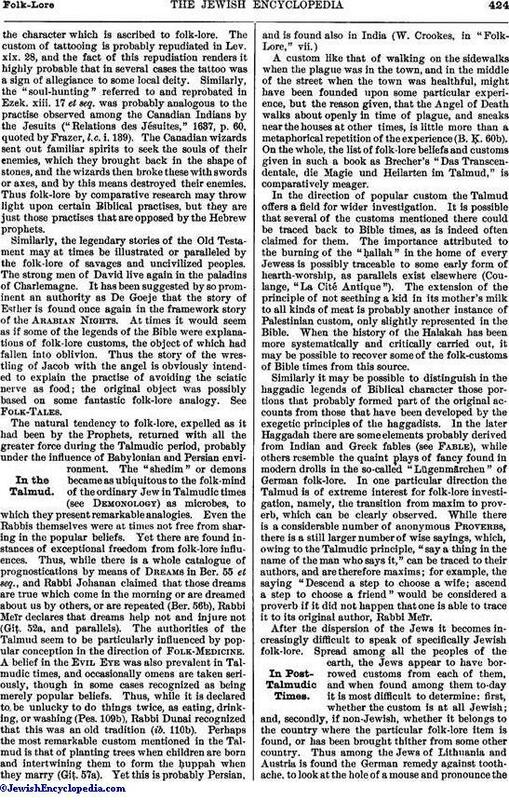 The Bidpai literature was transferred from the Orient to western Europe entirely by Jewish means (see Kalilah wa-Dimnah), and the same applies to the Sindbad, Barlaam, and other sets of Oriental tales. For the medieval legends which relate to Jews see Folk-Tales. The mutual relations between Jews and Christians, mostly antithetic, have given rise to a certain amount of folk-lore, in which may be included the myths of the blood accusation, and of host-piercing, besides such tales as that of the "Three Rings" and of "Shylock." 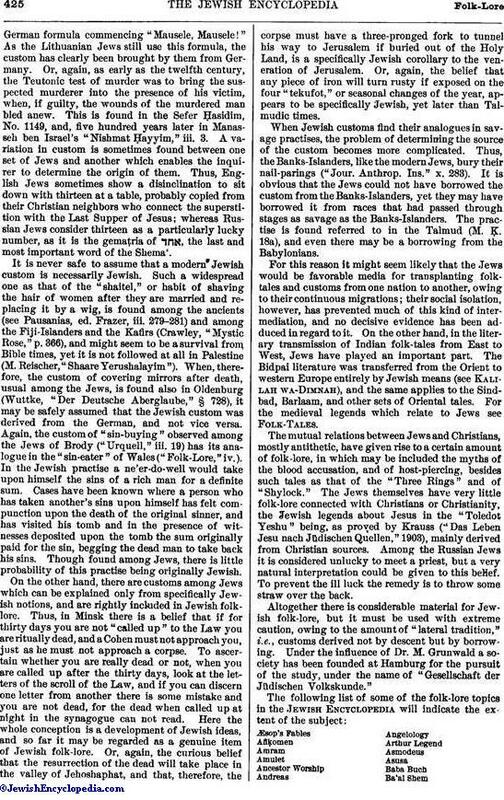 The Jews themselves have very little folk-lore connected with Christians or Christianity, the Jewish legends about Jesus in the "Toledot Yeshu" being, as proved by Krauss ("Das Leben Jesu nach Jüdischen Quellen," 1903), mainly derived from Christian sources. Among the Russian Jews it is considered unlucky to meet a priest, but a very natural interpretation could be given to this belief. To prevent the ill luck the remedy is to throw some straw over the back. Altogether there is considerable material for Jewish folk-lore, but it must be used with extreme caution, owing to the amount of "lateral tradition," i.e., customs derived not by descent but by borrowing. Under the influence of Dr. M. Grunwald a society has been founded at Hamburg for the pursuit of the study, under the name of "Gesellschaft der Jüdischen Volkskunde." Mitteilungen der Gesellschaft für Jüdische Volkskunde, 1897-1903.